On 25 February 2016 the prestigious Elite Research prize awards celebrate their first decennium. The prizes are awarded by H.R.H. Crown Princess Mary and the Danish Minister of Research Esben Lunde Larsen to researchers who have achieved promising results. A number of travelling scholarships are, moreover, awarded to talented PhD students. One of these is given to a computer science student from DIKU. Altogether three PhD students from University of Copenhagen are receiving an Elite Research travelling scholarship of 30,000 USD, respectively. Mathias Bæk Tejs Knudsen, who studies computer science at Department of Computer Science (DIKU) is one of the happy prize winners. He specialises in theoretical computer science and discrete mathematics, notably graph theory, as well as the understanding of randomness in analysis and construction of algorithms. The prize winners are considered some of Denmark's most talented research students. They will now be given the opportunity to visit other universities and establish relationships in international research environments. They are, moreover, expected to serve as role models for other young people considering a research career. Mathias will use his scholarship to finance his participation in a number of upcoming international top research conferences such as STOC, FOCS and SODA. For the latter Mathias has, by the way, already published a paper. 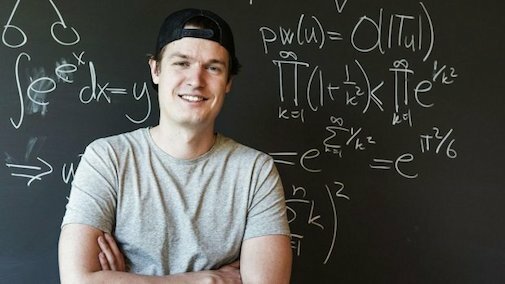 Moreover, Mathias plans to visit a number of American universities such as Stanford and Princeton, where he has already established relationships within the algorithmic research environments. In his nomination of Mathias, his supervisor professor Stephen Alstrup states: "When Mathias first started his PhD in January 2014, the first assignment I gave him was to read an article on additive spanners, a classic algorithmic graph theory subject. He did not just read the article - he even improved the results - an achievement which resulted in his first solo article. Mathias has, moreover, been main driver behind several other research breakthroughs, resulting in articles with other PhD students as co-authors. Throughout his first years as a PhD fellow Mathias has established personal relationships with researchers outside of the University of Copenhagen, including Danish Technical University and the IT University in Denmark. Mathias is both talented and hard working, and I am sure that with the right support he will accomplish very much". Both Mathias' supervisors, the DIKU professors Stephen Alstrup and Mikkel Thorup will present research result at the world leading upcoming algorithmic conference featuring the 20 best algorithmic results of the past year. The colleagues at DIKU congratulates Mathias. We are very proud!